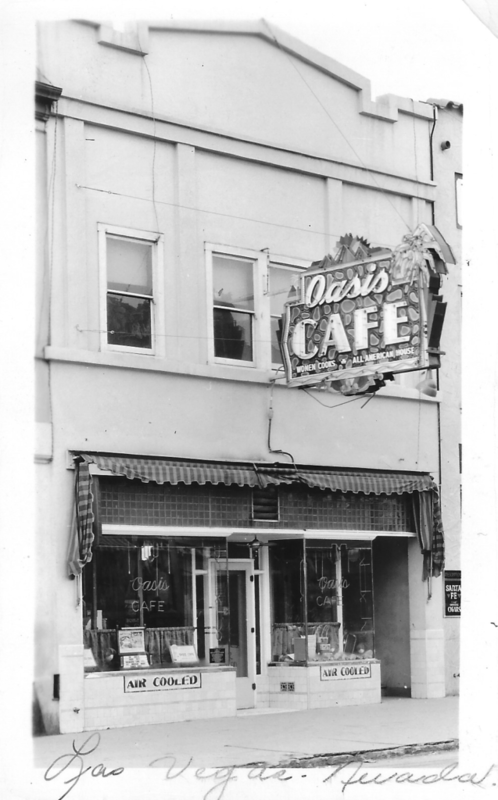 Chapter Two The first Neon signs of Las Vegas 1928-1929 – Oasis Cafe Not First Neon Sign in Las Vegas! Since posting The Overland Hotel had the first Neon sign in Las Vegas, several gentle folks have suggested it was the Oasis Café in 1927. Started researching the first Neon signs in Las Vegas several years ago and kept running into the following statements about the Oasis and the Las Vegas Club. a couple of bits of information. Sounds funny as a noun, EATS rather than a verb. In this case it must mean sandwiches or maybe fruits, or pastry, donuts . With that, looking for other Las Vegas “EATS” signs, as well as the one word circular signs with a cover. Pre Neon Oasis Cafe sign. The post card printers code, lower right, 1A1840 indicates the post card was printed late in 1931. Note the first Boulder Club Neon sign on right side. 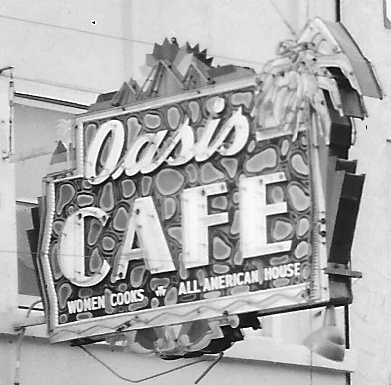 The statements about the Oasis Cafe having the first Neon sign are found on sites focused on Las Vegas, its history, and are clearly are sites where the creators and reporters, and universities involved have a respect and care regarding an accurate accounting of the history of the community. BUT! We have the many statement regarding the Oasis Café being the first to have a Neon sign in Las Vegas. Two days for the first are offered, 1927 and 1929. A second Neon story circulated that, at this point, has not basis in fact; the Las Vegas Club, in 1931 was the first hotel-casino to have a Neon sign. All of the above are from different sites, and there are many, many more. The Northern Hotel and Club had its neon sign up in 1929, when gambling on card games and some slot machines were legal. When additional gambling was legalized in 1931, the Northern was issued gaming license number one. 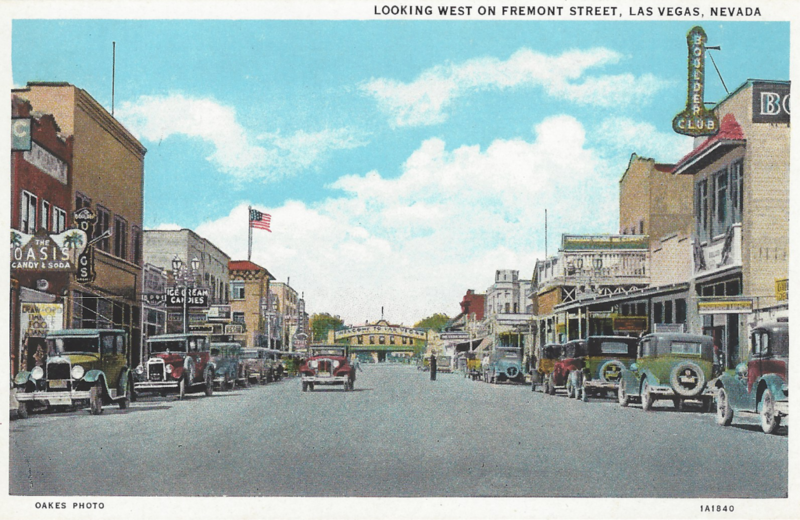 At the time the Las Vegas Club’s hotel, like the Northern was just wasn’t much of a hotel. The only reason the two club’s originally opened with a hotel on the second floor was it gave them the legal ability to sell alcohol. No hotel, no alcohol, as legal place, according to deed restrictions, to just retail alcohol “saloons” was on Block 16, the 200 block of north First. Unless there is something else added to the Las Vegas Club’s sign defintion to make it ‘first,’ it wasn’t the first. 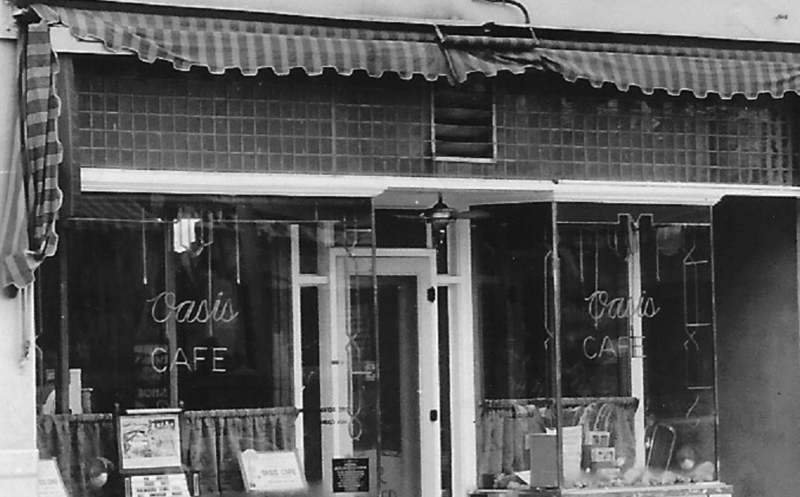 Second, the Oasis Cafe. 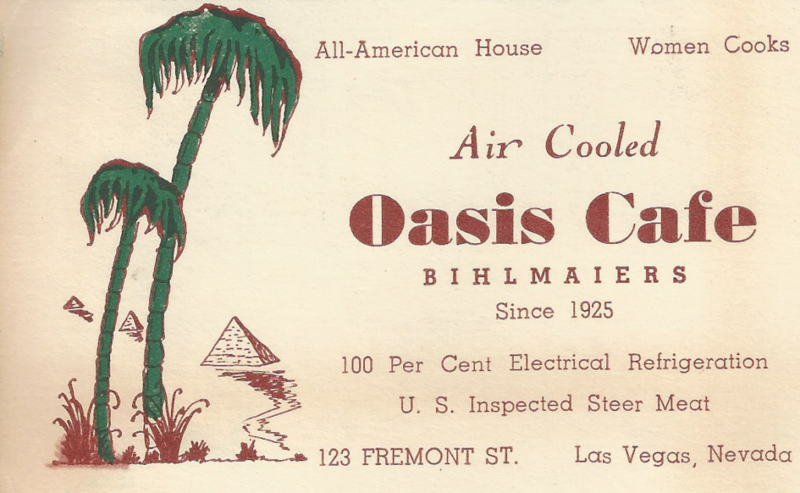 While it had a great address 123 Fremont Street, not sure how or when the Oasis Café was originally given the title of ‘first neon sign,’ in Las Vegas both in 1927 and 1929. So far, only able to find this article about Neon at the Oasis in the April 28, 1932 issue of the Las Vegas Review-Journal. 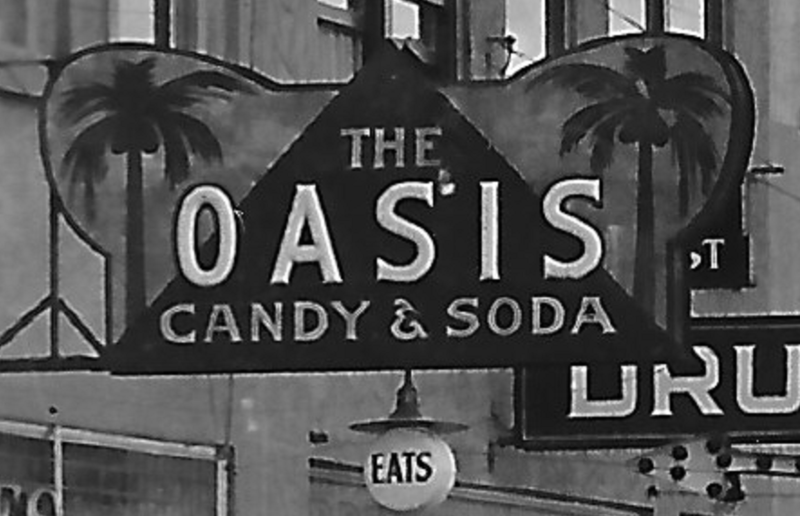 Unless there is a primary source for the Oasis Café having a Neon sign in 1927, The Overland Hotel’s Neon sign, the week of September 28, 1928 stands as the first Neon sign in Las Vegas. [i] “Neon Sign Being Placed at Oasis,” April 28, 1932, Las Vegas Review-Journal, page one. [ii] Display advertisement, Young Electric Sign Company, March 29, 1932, Las Vegas Review-Journal, page six, “A Legacy of Light, The History of Young Electric Sign Company,” 1995, Designed and written by Barbara Barell, printed by Paragon Press, Inc., page twenty-nine.